In this post we will use SQLite's full-text search extension to improve the search feature. In part 2, we added email reminders and check-able task lists to the note-taking app. We also converted the backend to use flask-peewee's REST API extension, which made it easy to add pagination and search. And that is how I've left it for the last three months or so. Below is a screenshot of the latest version of the notes app. The UI is much cleaner thanks to a stylesheet from bootswatch. The bootswatch stylesheet works as a drop-in replacement for the default bootstrap CSS file. Flexible pinterest-style tiled layout that looks great on a variety of screen sizes. Easy to create notes and reminders from the phone. Notes support markdown and there is also a simple WYSIWYM markdown editing toolbar. Links are converted to rich media objects where possible (e.g. a YouTube URL becomes an embedded player). To-do lists (or task lists) can be embedded in notes. Email reminders can be scheduled for a given note. You can browse or download the finished code from part 2 in this gist. If you're in a hurry, you can find all the code from this post in this gist. Bookmarking interesting sites to read later. Creating short to-do lists or writing down particular items to get from the store, etc. Writing down interesting dreams or ideas I get in the middle of the night. Appointment reminders, reminders to call people, etc. Writing down ideas for programming projects. Saving code snippets or useful commands. In this installment, we'll be using SQLite's full-text search (FTS) extension to dramatically improve the search result quality. Besides giving us better results, SQLite's FTS extension supports boolean-type search expressions as well as custom constructs like NEAR. A full list of supported queries can be found in the SQLite documentation. Most importantly, by using full-text search we are now able to sort our search results by match quality. For a detailed write-up on using SQLite's FTS with Python, check out this post. To use the FTS extension, we need to create a special table called a virtual table. Virtual tables are meta-tables that present a high-level interface for working with special extension data. The FTS virtual table allows us to store search content, and behind-the-scenes several hidden tables will be created to store the actual search data-structures. The peewee playhouse Sqlite extension provides a model sub-class designed for working with virtual tables, and more specifically, a virtual model subclass for the FTS extension. The first step is to replace our peewee database class, swapping out the default SqliteDatabase for the playhouse's SqliteExtDatabase, which provides support for virtual tables. Now that we have updated our database class, we can start using the FTS extension in our peewee code. # Place these imports at the top of the module. # The FTSNote class should go just below the Note class. # Simple regex for stripping out any HTML tags. Now that we have a place to store our note content, we need to determine exactly what content to store. As is hinted by the HTML_RE attribute, I opted to strip out HTML from the note -- which also would seem to indicate that I'm processing any markdown or oEmbed content as well. # Store the content for full-text search. In order to make use of our search index, we will write a new Note.search method. SQLite uses a special operator MATCH to perform a full-text search query, and this operator is exposed, for convenience, as a method on the playhouse FTSModel class. The only other interesting part is to ensure the results are ordered by relevance. SQLite does not provide an out-of-the-box search ranking algorithm, but the playhouse.FTSModel provides two algorithms you can use (see documentation for more details). # Return an intentionally empty query. # Recombine the cleaned search phrase. When we implement search in part 2 of the series, we simply passed an additional filtering parameter to the API endpoint (content__ilike=search terms). In order to use our new search method, we'll need to create a custom search endpoint. Luckily, this is quite easy -- we just add a new URL route to our NoteResource class and call it from the front-end. # Add this import to the top of the module. # Add the following methods to the NoteResource class. notes = self.process_query(notes)  # Apply any filters, etc. 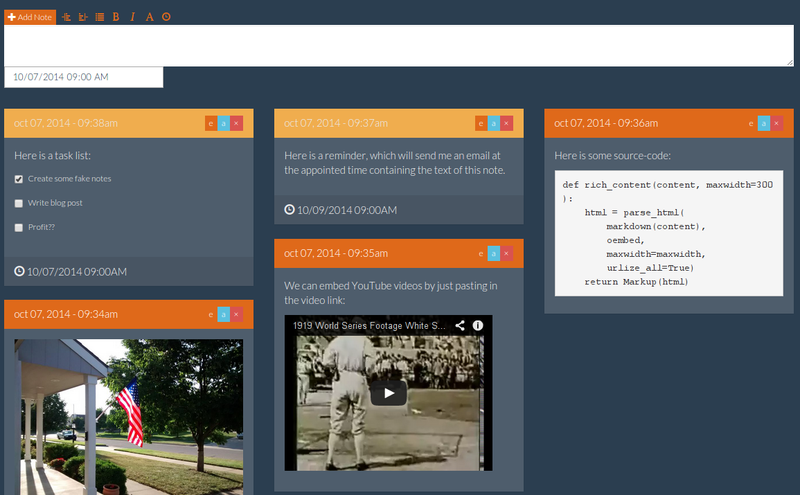 Finally we will modify the notes.js script to use the search endpoint when performing a search. var url = search ? '/api/note/search/' : '/api/note/'; // New. if (search) requestData['query'] = search;  // New: include the search query. // New: this call changed from a hard-coded URL to the new url variable. That's it! Our notes app now has very robust full-text searching capabilities. Thanks for following along, I hope you enjoyed this post. In the next installment we will be building a command-line client for working with the notes app. This client will make it very easy to work with the notes app from the command-line. Since we won't be able to easily browse lists of notes, having a quality search interface will be very helpful for finding notes. This gist also contains some additional changes which were not covered in this post for reasons of brevity, but which may be useful to you. Added capability to edit notes after they've been saved. Re-wrote the reminders task to be more robust. Simplified the Note model, and included a migration script. Added an optional days parameter to the search function to limit our search to a certain number of days in the past. You can browse a diff of the changes here. Notes app source code including diff of changes. 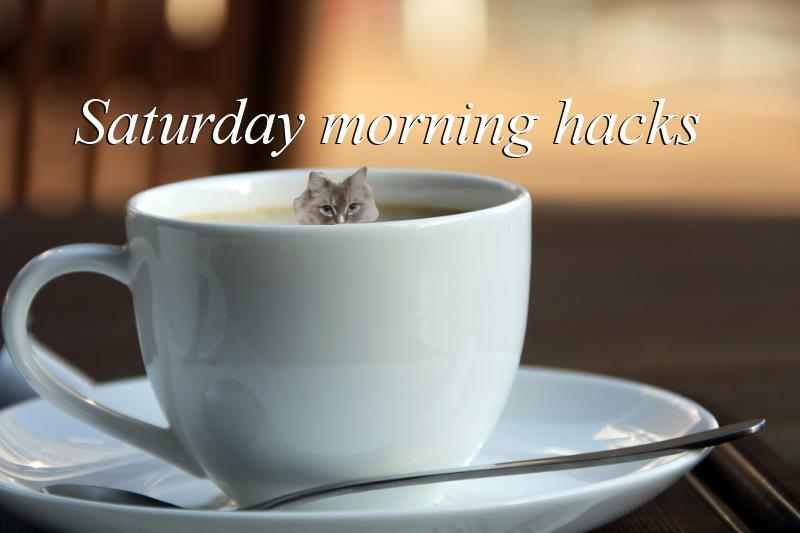 Or simply look at all of the saturday-morning hack posts.